Synopsis: Chloe Saunders is on the run and raising hell. Literally. Chloe Saunders is not your average supernatural teenager. Genetically altered at birth by a sinister team of scientists, she can barely control her terrifying powers. Now the team that created her has decided it’s time to end the experiment. Permanently. Now Chloe is running for her life along with a charming sorcerer, a troubled werewolf and a temperamental young witch. Together they have a chance for freedom – but can Chloe trust her new friends? Honestly, I forgot how good the second book gets in Armstrong’s Darkest Powers trilogy! There’s so much happening in comparison to the first novel, and a ton of focus on character exploration. It took me about two days to read this — and that’s only because I couldn’t read this at work and I have fitness after work most days. So hang on to your butts (ha-ha … Jurassic Park references FTW)! This sequel is an enticing, fast paced adventure — one that’s bound to make it almost impossible to put down! CONTENT & TRIGGER WARNING: This book contains bullying (minimal), murder (mentioned), hospitalization, loss of a loved one (mentioned), previous loss of a parent (mentioned), suicide (mentioned), pills (medical), and violence. In comparison to its predecessor, The Awakening explores a larger number of settings and is full of action! One of the things I found rather mundane about The Summoning is the fact that a LARGE portion of the novel takes place at Lyle House — which grows boring after a while. The Awakening has the main characters travelling throughout the United States, on the run from their previous captors. But it’s not just the numerous settings that make this exciting — travelling on the road allows for more dangerous situations to occur, providing a wealth of action scenes and a focus on survival to peak our interests! Armstrong begins to disclose more information regarding the plot … FINALLY! The Summoning is fantastic … but it’s also SO FRUSTRATING! There’s so much we don’t know about the characters, their powers, why they were never told about them, and the company who held them captive. The Awakening changes things up, providing us insight into why people like Chloe’s parent’s never told their children about who they are and what they can do. There’s also a ton of information regarding the company that “owns” Lyle House and what their plans. With hints of something much greater than Chloe and the gang could ever imagine, the second book in this trilogy makes it hard not to run off and buy the third book for all the answers! Anyone that’s a character oriented reader will thoroughly enjoy this story. 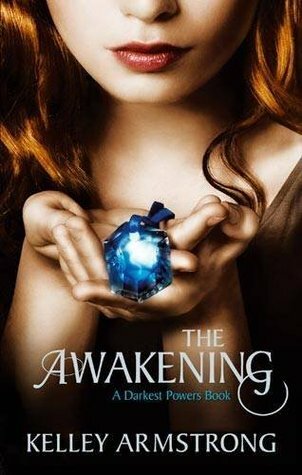 Though there’s the supernatural elements, the “big-bad-scary” company and employees, and a number of other subplots, The Awakening is the PERFECT “character focused” read. The novel’s carried by the characters’ growth and actions, following the story through their development and discoveries. The second book in particular focuses LARGELY on Chloe and Derek, with Simon and Tori as secondary MC’s. It’s about both personal growth and their connection to one another. What I also like is Armstrong explains why certain characters act the way they do (mainly, Tori and Derek), helping readers to understand them more AND make sense of how all their powers effect them differently. The change from scene to scene flows wonderfully, making it difficult to put down. It’s like binge watching that amazing Netflix show that you end up finishing in one day … but in book form. Armstrong carefully crafts each scene, providing the perfect yet subtle transition to move onto the next part — it’s never abrupt or out of place. Armstrong’s impeccable attention to every little bit of detail in her novels is what makes her such a well-known and fantastic writer — nothing is ever written without a reason. The fluidity of the writing makes you finish the novel before you even realize it. For those of you who prefer expansive stories and world building, this may not be your cup of tea. For me, this wasn’t an issue — I’m a character oriented reader. But for those of you seeking world building and plot development similar to Rowling’s Harry Potter or Tolkien’s The Lord of the Rings, you’ll probably be a little disappointed. Armstrong’s Darkest Powers trilogy does have a fascinating plot that pulls readers in, but it’s honestly a CHARACTER HEAVY FOCUSED TRILOGY! It’s all about the characters learning to control their powers, coping with what happened to them, seeing how they survive on the run, and learning how they grow not only as a group but as individuals. So for me … this isn’t a woe, but it may be for you. As much as I love them, it takes a while to like Tori and Derek. No matter what anyone else says, I love both of these characters — especially Derek (*my teen self swooned over him*). However, they aren’t characters that you’re meant to like at first. For one, Tori’s a bully and has some serious aggression towards other — especially Chloe. But as you learn more about her, it begins to make sense … kind of. I honestly can’t stand her until the later half of the novel. With Derek … that’s another can of worms. He’s intelligent and I love an MC with physical imperfections yet is shown as an attractive person … but his ANGER AND BERATING TOWARDS CHLOE HURTS ME! He’s like that with most people, but mostly Chloe (and I’m not into the bully-to-attraction thing …). However, learning his supernatural abilities and what the company that owns Lyle House did to him REALLY explains his persona … which I’m not spoiling, since that’s a big part of book one and book two. Just know that if you do your research into the lore … it makes sense (BUT IT’S STILL FRUSTRATING). Armstrong’s The Awakening is a FANTASTIC sequel in the Darkest Powers trilogy; the novels draws upon some unanswered questions in book one yet allows for the reader to discover more in the final novel, The Reckoning. This suspenseful and exciting supernatural YA series is one of my all-time favourites, for it provides an intriguing plot with a wonderful set of MC’s. The research Armstrong has done regarding the supernaturals is also a delight, staying fairly accurate to the lore yet adding a little something extra to make it her own. If you love The Summoning and are eager to follow Chloe’s next adventures, get on that sequel. And if you haven’t started this trilogy yet … WHAT ARE YOU DOING HERE?! GO BUY THE SET! Great review! Thanks for reminding me of this series – it used to be HUGE and I haven’t seen it in so long! Glad you enjoyed this!